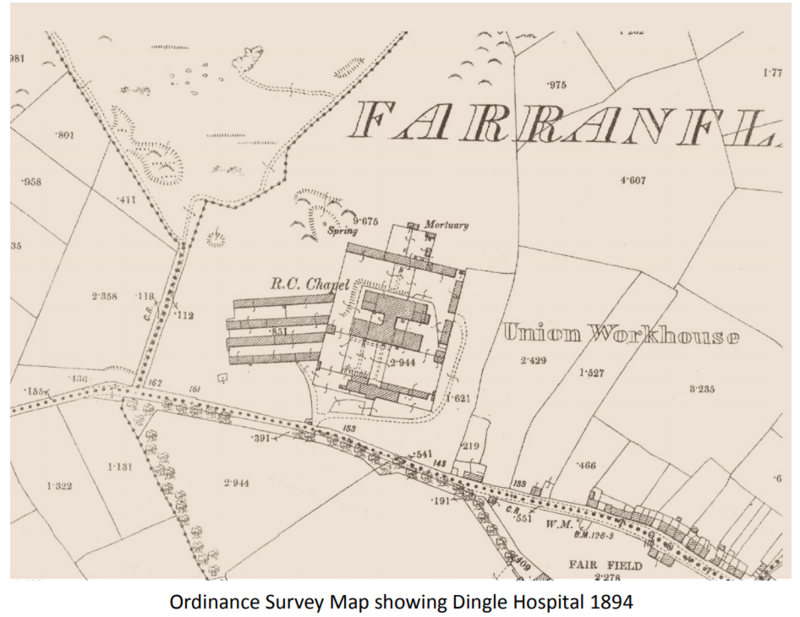 Dingle Union Workhouse, fever hospital, school and dispensary were opened in August 1850. It was run by the local Board of Guardians assisted by the Order of Mercy from 1889. In February 1922 the board of Guardians was abolished and its functions transferred to the health board. 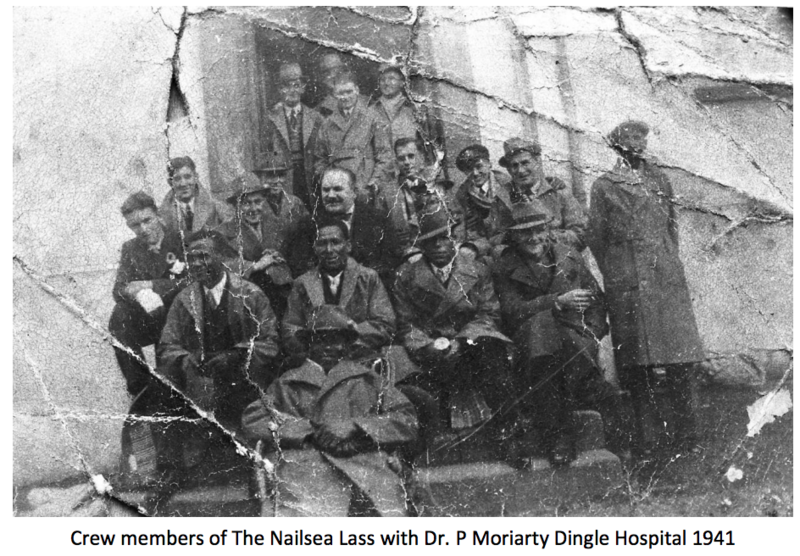 In 1922 Dingle Workhouse closed and about 40 inmates were transferred to Killarney. The building then became St Elizabeth’s Hospital serving the Dingle Peninsula until it closed in 2010 when the new West Kerry Community Hospital opened. Leagan Gaeilge – Bruaigh Anseo! 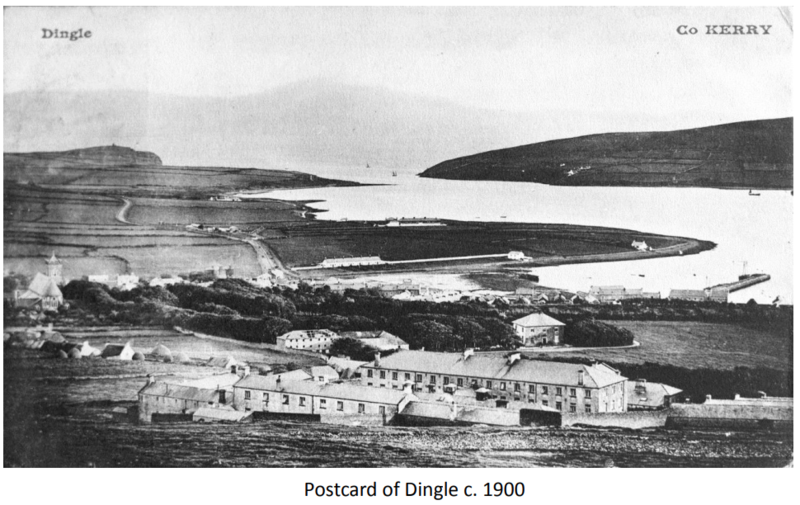 Dingle in the Nineteenth Century. The Dingle Peninsula was one of the most isolated and poor districts in Ireland in the 19th century with a population of 35,815 in 1841.It was part of the Tralee Union/District – one of the largest in Ireland with a population of 110,759. Kerry’s population before the famine was 293,880 in 1841. Subdivision of land holdings was a progressive feature of rural Ireland since the mid-eighteenth century. The gradual replacement of a cereal and dairy-based diet by potatoes facilitated a surge in population from 6.8 million in 1821 to 8.4 million in 1841. The French traveller Gustave de Beaumont observed in 1837 that “the Irish Catholic finds only one profession within his reach-and when he has not the capital necessary to become a farmer he digs the ground as a labourer…. He who has not a spot of ground to cultivate dies of famine.” By 1845 one third of all tilled land in Ireland was given to potato cultivation. 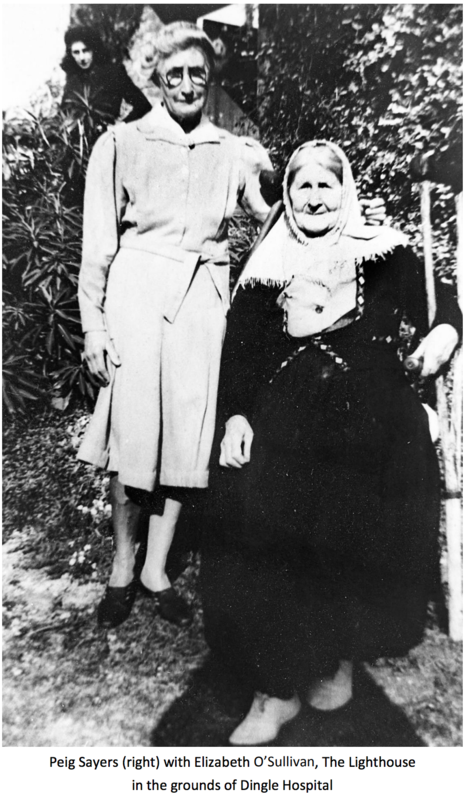 Living conditions for most of the population became increasingly difficult with oppressive rents and bad housing. The British government enacted the 1834 Poor Law Act to deal with widespread poverty. The same act was introduced in Ireland as the 1838 Poor Law which divided Ireland into 130 poor law unions, each to have a workhouse that was administered by a Board of Guardians. English architect George Wilkinson arrived in Dublin in January 1839 tasked with the design of 130 workhouses and his plans and specifications were submitted in February for approval. Almost all were built to Wilkinson’s standard plans. The workhouse system in operation from 1840 onwards was unable to deal with the awful need created by the famine from 1845. As the numbers going into the workhouses increased the system became overwhelmed – workhouses designed to hold a few hundred people were forced to hold thousands. In March 1847 130 workhouses were filledto capacity with 115,000 inmates; by 1851 these same buildings held 217,000. Potato blight was reported in Dingle in October 1845 when the local constabulary Sub-Inspector Mr. Gillman stated that the crop might only be one third of that expected. A month later Fr. Daniel Healy, Parish Priest of Kilmalkedar, wrote to Lord Cork, the local non-resident landlord, confirming the loss of the potato crop and stating that the fishing industry had collapsed. The devastation of the first year of the famine is clear in another letter of Fr Healy’s to Dublin Castle in which he writes that one thousand out of ten thousand of his parishioners were starving. By March 1846 private chaplain to Lord Ventry and rector of Dunurlin and Ventry the Rev Charles Gayer asked “how are we to provide coffins for the people?” After the failure of the potato crop in 1846 mortality rose significantly. In November Thomas Trant, secretary of the Dingle Relief Committee stated that “the utmost destitution prevailed in Dingle”. At this time the poor and distressed of West Kerry had to travel up to 40 miles to the workhouse in Tralee and frequently were turned away. In November 1847 the Tralee board of guardians considered acquiring a temporary workhouse for Dingle but nothing happened until March 1848. 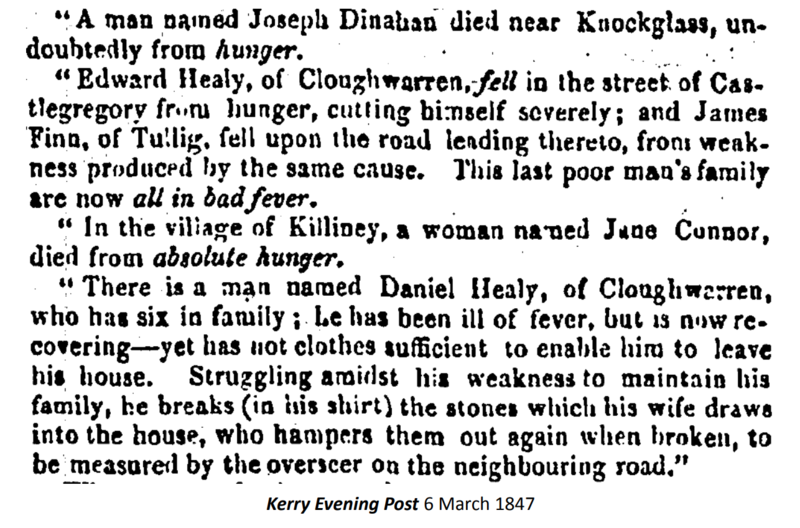 Meanwhile harrowing accounts of death and disease feature in the Kerry newspapers. 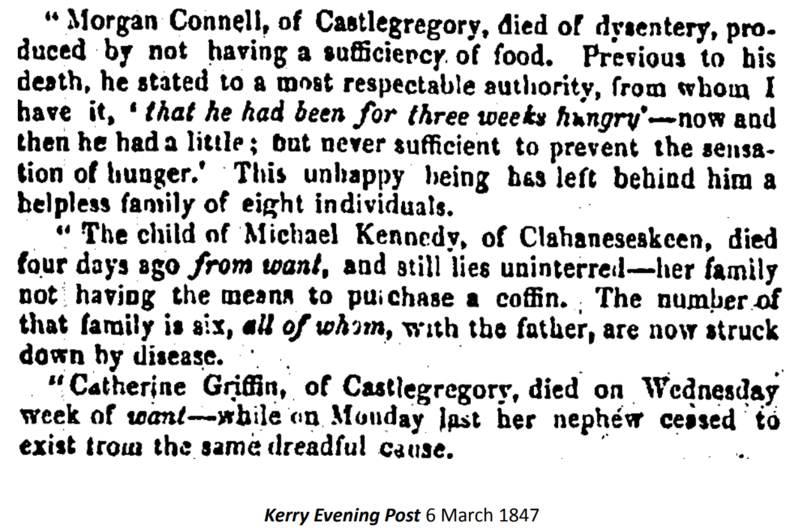 Some of the most detailed and graphic accounts of the famine years locally were written by the medical officer of Castlegregory dispensary Dr John Busteed to the Kerry Evening Post. The following was published on 6 March 1847. After the Temporary Destitute Act (“Soup Kitchen Act”) of February 1847 soup kitchens were provided nationally for outside relief for those who could not get access to the workhouses. 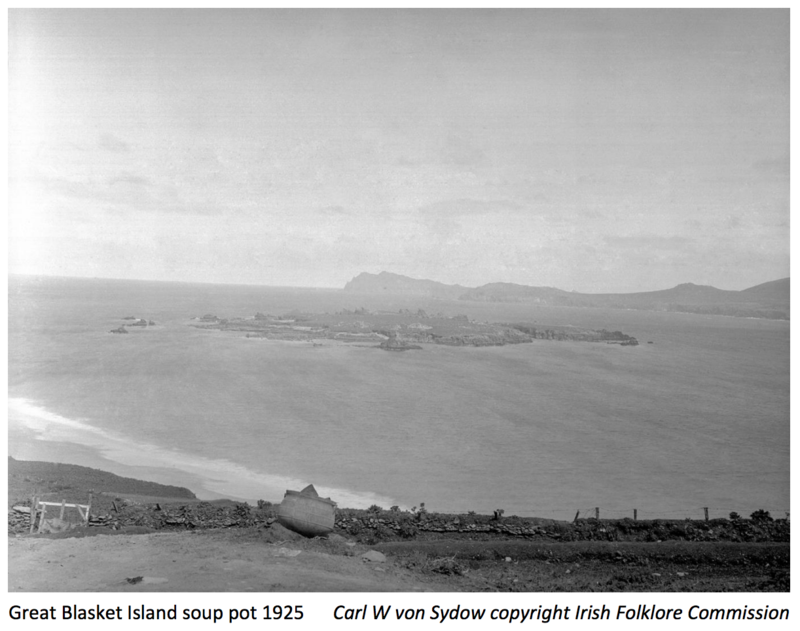 Prior to this soup kitchens were being operated on the Dingle Peninsula by local relief committees and private individuals. These were established at Ballyoughtra, the Great Blasket Island, Dunquin, Monaree, Ballintaggart, Liscarney and Lough. In June 1846 Mr. Patrick Grey made an application at the County Special Sessions for the erection of a Fever Hospital in Dingle. The application was declined. The Tralee Board of Guardians passed a resolution in February 1848 that a building belonging to Patrick Grey and the old brewery belonging to Mr. Eager be used as temporary workhouses. Over the next two years thirteen more temporary workhouses opened in the Dingle area –eleven in the town with one twelve miles east at Liscarney and another two miles west at Monaree. During this time a decision was made to build a permanent workhouse in Dingle. The Building of the Dingle Workhouse. “No individual capable of exertion must ever be permitted to be idle in a workhouse”. The Poor Law Act of 1838. 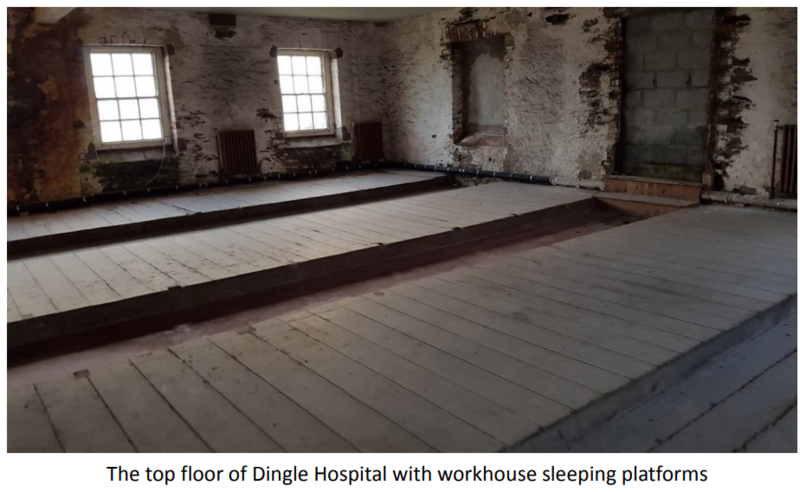 Dingle Workhouse was one of 33 extra workhouses and the last one built in Kerry, opening in 1850. The Report of the Poor Law Commissioners for Ireland in 1839 stated that “the style of the building is intended to be of the cheapest description compatible with durability; and effect is aimed at by harmony of proportion and simplicity of arrangement, all mere decoration being studiously excluded.” It was to be built to architect George Wilkinson’s standard plan. The workhouse building cost £6,850 with £1,380 for fittings. It was proposed that it would have accommodation for 700 inmates. The first admissions were in August 1850 with 1281 inmates recorded by May 1851. 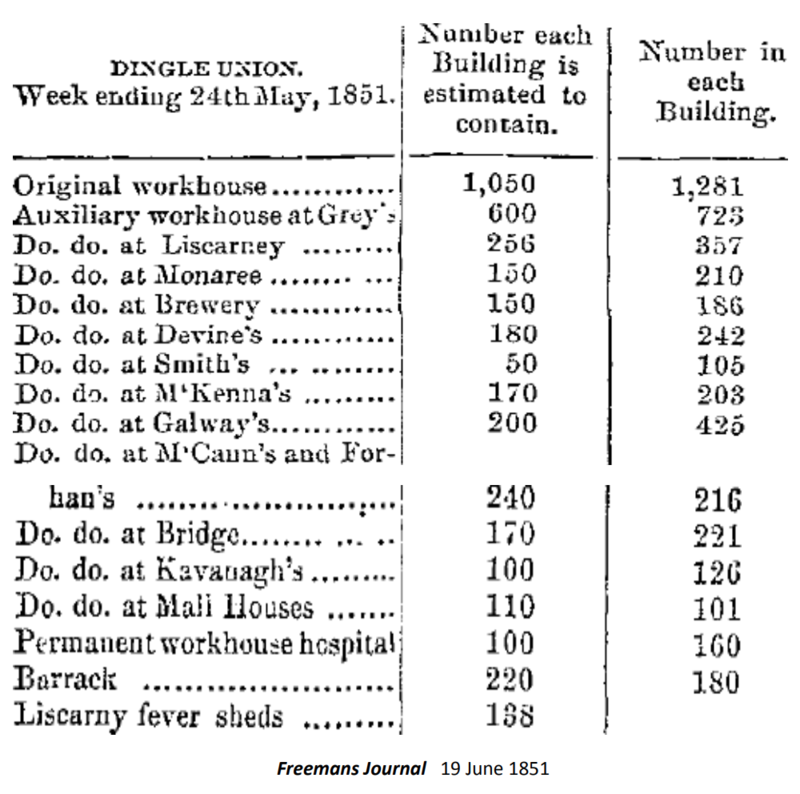 At a time when Dingle was described as “one monster pauper asylum” the total number in the main and auxiliary workhouses was 4,848-17.7% of the population of the peninsula. 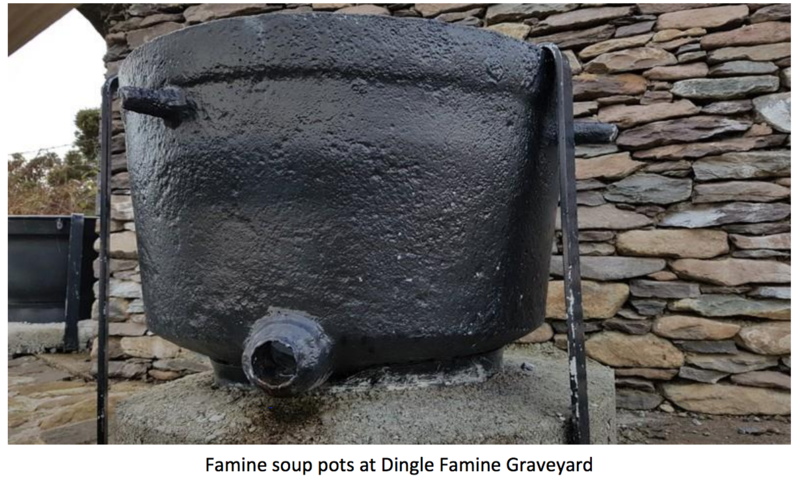 The ratio of workhouse inmates to general population gives an indication of the devastation of hunger and disease – the ratio was 1:7 in Dingle, 1:14 in Skibbereen and 1:200 in Ballymena, Co. Antrim. The separation of families was one of the saddest facts of life in the workhouses. On admittance fathers and sons went to the male quarters, children over two went into children’s wards, mothers and daughters under two went to the female quarters. Many families never saw each other again. Conditions within the workhouse were designed by the 1838 Poor Law Act such that the inmates should be “worse fed, worse clothed and worse lodged than the independent labourers of the district”. The work undertaken included the men breaking stones, grinding corn, working on the land attached to the workhouse with the women at house duties, mending clothes, washing, attending the children and the sick. Death was part of life in the workhouse and burial grounds were opened nearby to deal with the large number of corpses. Most emigration during the famine in Ireland was voluntary. The Tralee Chronicle details a total of 674 people who left here via assisted emigration including one group of 116 who left on the Hurron from Blennerville on 19 June 1851. A group of twenty girls left Dingle Workhouse for Australia under the Earl Grey scheme. Ireland’s population fell by 20% and Kerry’s by 19% between 1841 and 1851. The greatest falls in population in the Dingle Peninsula were in Ballyferriter ( – 49.9%), Dunquin and the Blasket Islands (-48.2%) and Minard (-48.4%) followed by Kilquane (-43.3%), Kilmalkedar (-43%), Garfinny (-44%), Kinard (-43%) and Ventry (-42%). Kerry’s population drop is not evident in the census figures as emigration only accelerated here in the 1850s. Rescued Soldiers in World War 2. In February 1941 the merchant vessel, The Nailsea Lass, was torpedoed 60 miles southwest of the Fastnet Rock. Nineteen of the survivors came ashore at Ballyoughtra, Ballyferriter and were admitted to St Elizabeth’s Hospital. Peig Sayers, the noted storyteller from Dunquin & the Great Blasket Island was a patient in the 1950s. During this time, she was visited by Irish scholars, folklore collectors and was recorded by the Irish Folklore Commission, Radio Éireann and the BBC until her death in 1958. From the mid-twentieth century pressure from the public, nuns, local clergy and local politicians on Kerry County Council lead to gradual improvements. The wards were upgraded, maternity facilities were improved, and two wards were assigned for patients suffering from TB. From the early 1970s Dingle Hospital evolved into a community facility caring for the elderly. It had 43 beds, divided into four wards and three two-bedded rooms. There were two female wards on the ground floor and two male wards on the first floor. The hospital beds were classified as long-stay, acute, rehabilitation, respite and hospice. Dingle Hospital closed 2010 and the patients were moved to the new West Kerry Community Hospital. John Crowley, William J Smyth, Mike Murphy, Atlas of the Great Irish Famine. Tom Fox, Dingle Down the Years. Dr Shane Lehane, The Great Famine in Kerry. John O’Connor, The Workhouses of Ireland The fate of Ireland’s poor. An Mon. Pádraig Ó Fiannachta, An Gorta Mór. Dr Finbar O’Shea, Céad Bliain sa Daingean Siúracha na Trócaire 1889-1989.